It’s not quite news that Cookie Monster no longer eats cookies. Well, he eats ONE cookie. After he fills up on vegetables! Vegetables!! Understandably, the public was outraged, and in response, Cookie felt the need to clarify: He still eats cookies—for dessert—but he likes fruit and vegetables too. Cookie Monster needed to reassert his identity, so he did what anyone would do: He interviewed with Matt Lauer. * The message was plain:He’s a Cookie Monster and Cookie Monsters eat cookies. They dream of cookies. They would bathe in cookies if they could. They can’t get enough of cookies. (Om nom nom!) But can Cookie Monsters eat fruits and vegetables too? Sure, I can understand why Cookie has been dissuaded from pursuing his pastry delights with abandon. We’re in the midst of an obesity epidemic and children are most threatened. As adults, they’ll face a number of complications, including increased risk for diabetes, heart disease, high blood pressure, sleep apnea, and other woes. Cookie Monster IS a role model. Sesame Street has been a beacon in children’s education for decades, and the habits children learn in their early years will likely follow them through their lives. So Cookie has given up his plate of delicious cookies, practices restraint, and eats more leafy greens in the hopes that young children will do the same. Now I watched Cookie Monster devour plates of cookies when I was growing up, and I have to tell you … I don’t tend to devour plates of cookies now as an adult. I learned healthy eating habits from my parents. I understood that Cookie Monster was meant to eat cookies in a way that I wasn’t. (And truthfully, how many of those cookies actually made it into his mouth anyway? Most wound up as crumbs all over his fur, which was more reason NOT to devour cookies as he did.) But I suppose that having Cookie model moderation may support parental messages at home. As I said, I get it. Cookie Monster raps about health foods. However, are we forcing our standards on Cookie? Forcing him to change who he really is? 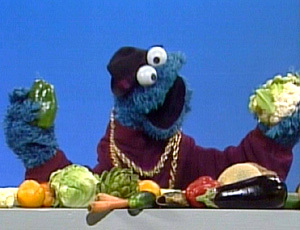 Cookie Monster actually begin singing (really, rapping) about eating healthy foods in the late 80s. There was no uproar then perhaps because the shift seemed less radical. Who cared if he was a closet veggie eater? But is it acceptable for Cookie to change? Is Cookie Monster's identity caught in flux as a result of conflicting messages about who he is and who we as a society, as his network, expect him to be? And in all seriousness, what kind of message does this send to children? That they should repress who they are in favor of the norm? That there is an ideal to strive toward? That once they’ve established an identity, they can’t change? Cookie Monster’s cookie/vegetable dilemma provides a good opportunity to investigate the mechanisms of identity formation. Daniel MacFarland and Heili Pals (2005) evaluated internal and external motives that inspire change, and determined that change to the network is the driving factor in identity shifts over time. MacFarland and Pals thoroughly dissect social identity theory (SIT) and identity theory (IT), competing models of identity change, and conclude that in both theories the actor perceives an inconsistency which leads to a change in identity. Essentially, the actor seeks to establish an identity because he or she believes that it fails to meet a standard. In the case of Cookie Monster, we have two standards in conflict: Cookie is a monster who eats cookies (internal), and Cookie needs to promote moderation as demanded by his larger network of fans and supporters and in keeping with social trends (external). We shall see how these theories lead to pressure for Cookie Monster to change. Categories are more than labels; they act as constitutive rules or representational systems of meaning that are recognized by wide segments of a society. Categories establish expectations of and for behavior, and even suggest a narrative history of group membership … Category labels can reflect notions of status, permanence, size, and other meanings that influence the actor’s motive to improve his or her situation (MacFarland and Pals 2005: 291). So categories like race and gender tend to shape identities in very concrete ways because it is hard to separate self from visible traits of these categories (292). Cookie Monster is a monster who likes cookies. He is bound by this identity, and it places an expectation on him that he will behave in particular ways. He strives to be the best Cookie Monster he can be, as is evidenced from the clip with Matt Lauer where he insists that he can have the cookie—after he has had the veggies. According to IT, the self consists of a collection of “role identities.” Persons switch role identities depending on the salience of those identities to the context. According to Stryker and Burke (2000), network contexts create a hierarchy of salience among the various identities that constitute the self, and lead the actor to invoke the same role or to alter performances over time. Therefore the feedback from a relational context defines identity salience, and this in turn gives rise to motives for identity change (MacFarland and Pals 2005: 290). IT is external and fluid, driven by the changing needs of the network. Our society—Cookie Monster’s larger network—is oriented toward a certain image of acceptable eating—even though it has largely not been the norm—and Cookie has to shift to meet this expectation. However what we have is an inconsistency between the ideal self (the self that the individual would like to be), the actual self (the self that the individual is), and the public self (the self that other perceives the individual to be). Cookie Monster would like to be able to eat cookies and vegetables (ideal), but feels that he has to eat more vegetables and downplay his cookie eating tendencies (actual), while the public thinks that he is hypocritical for enjoying vegetables but a subset wants him to eat more greens (public). Actors who report that 50 percent of their five best friend are in the same crowd as themselves are 21 percent more likely to report having a socially verified identity than are actors with only 23 percent of their five best friends in the same crowd. Students with 100 percent of their friends in the same crowd are 63 percent more likely to believe that their selves are socially verified (2005: 303). Categories thus are cultural constructs that signal meanings somewhat independently of the relations and interactions in which they are embedded. They define situations for their members, and offer hypothetical situations to persons who consider joining them. Actors not only adapt to their category affiliation but also self-select into affiliations, or seek membership in more appealing, more suitable categories (308). So Cookie can change—he is not bound by the construction of “cookie monsterness” (the public ideal). We have a perception about what cookie monsters do, and it has fueled public discontent. The category that Cookie Monster has been placed into is one that we have created. We have generated behaviors and expectations that fit the monster mold. Change does not undo his “cookieness.” Cookie is striving for the ideal self, following a shift by a subset of his network. Cookie Monster has to decide which portion of his network he will fit with: the veggie group or the cookie group. Perhaps he can achieve an actual self that isn't guilt stricken over his love for cookies. Really, is it that bad if he has TWO cookies? *Edit: The video of Cookie Monster and Matt Lauer was not loading properly and causing the entire blog to behave strangely. I inserted a link and removed the embedded video. The cookie monster needs to eat cookies. We are oppressing the Cookie Monster's rights and freedoms to eat as many cookies as he wants. What kind of message are we sending our children? DonorsChoose Finish Line Up Ahead—Can You Help?